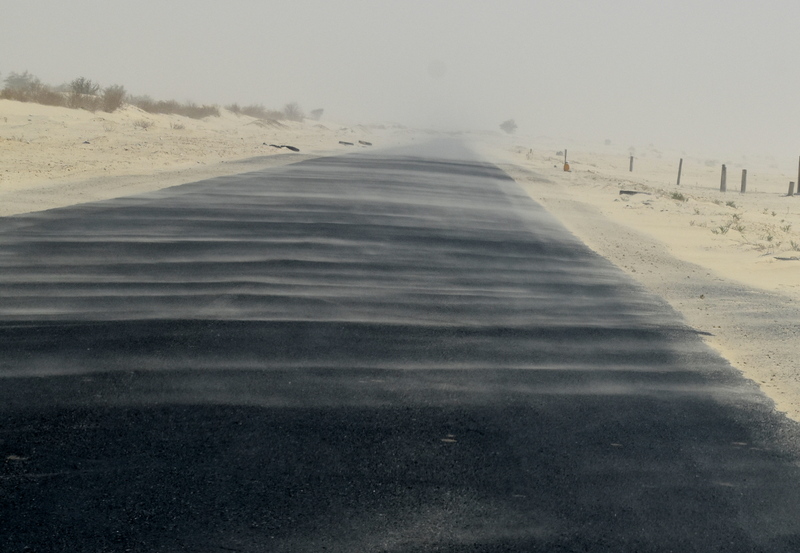 The first indication we had of what was to come was driving down the highway and noticing sand being blown on the road in stripes and then a white out. And it continued and continued making us realize we couldn’t do anything outside or we would be bombarded by sand in a strong wind. And we were. 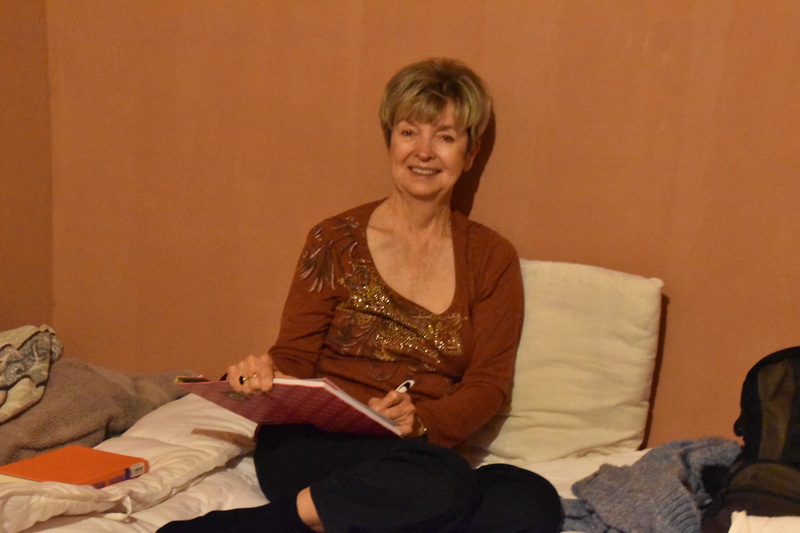 In one hotel, June just couldn’t stand the sand anymore because the floor and bathroom were covered in sand. So she requested a broom, mop and dustpan from the hotel and began to clean. 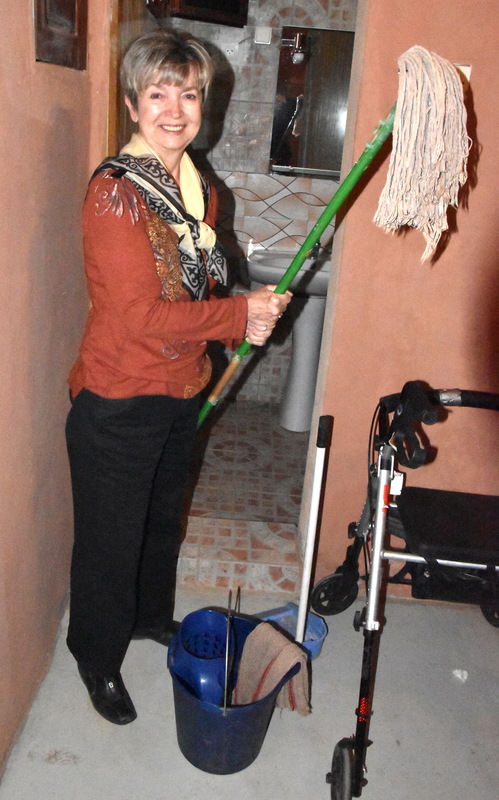 But When Mohamed saw her cleaning, he took the broom from her hands and started sweeping the entire room. She asked him where he placed the pile of sand he got from the room and he replied “behind the toilet.” We both died laughing. 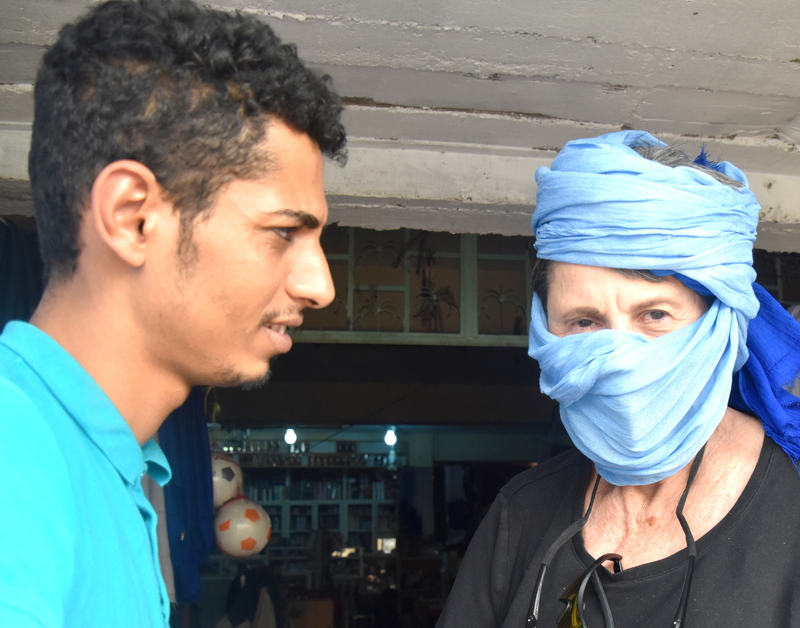 Mohamed showed we how to wrap the turban so sand won’t get into any holes or crevices. We had sand in every crevice or crack or bend or hole in our body. Everywhere we walked, we walked on sand and sat on sand and ate sand and any other thing you could do with sand. It made us respect the camel more because it had eyes, a nose and ears that could be closed in a sand storm. Closing ours didn’t help. They still had sand in them. We had sand everywhere. 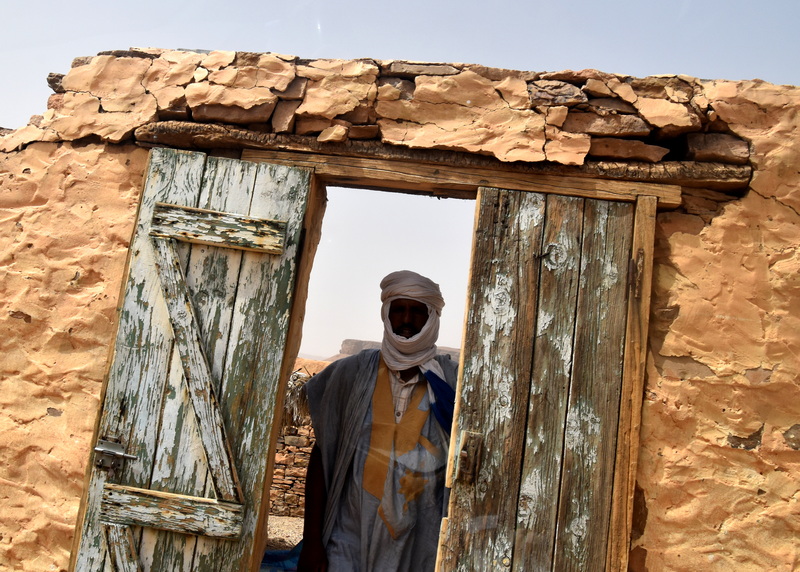 And it lasted for the 4 days June and I were in the Sahara Desert of Mauritania following a caravan route in a pickup truck. In that truck was our guide and driver, Mohamed, our cook, Mounir (Moo-near) and June and I. 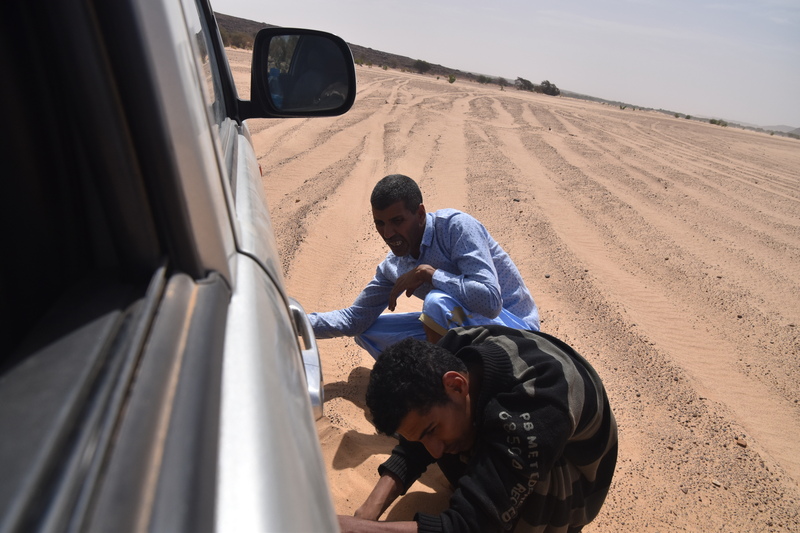 We were following a caravan route in northern Mauritania because I could not walk for the 44 days that a normal walking caravan takes with camels. 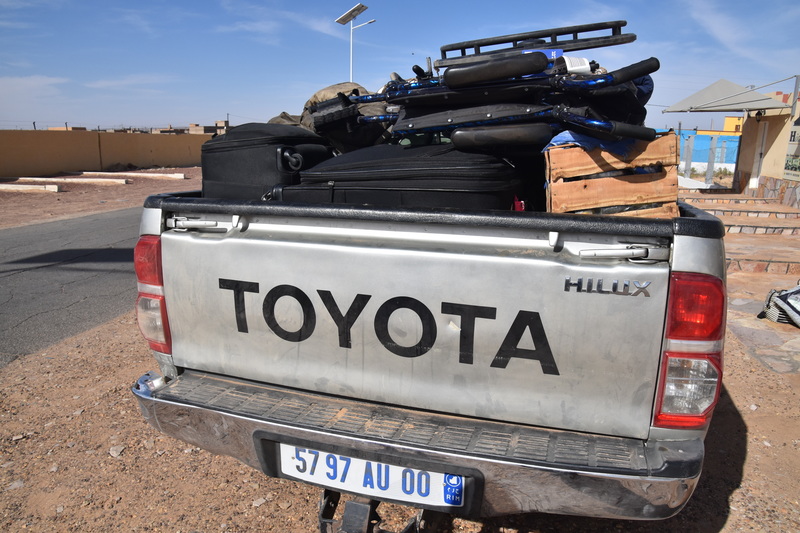 Instead of camels carrying supplies, our truck was packed with food, water and our luggage and any other thing we needed for 4 days for the mini caravan. 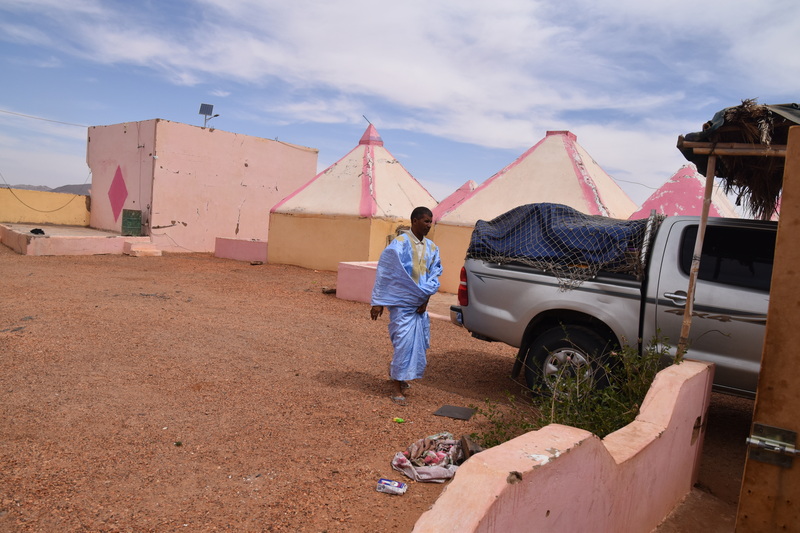 Our custom designed mini-caravan had us staying in the best available hotels possible in the villages closest to the caravan route instead of staying with nomads and in tents. 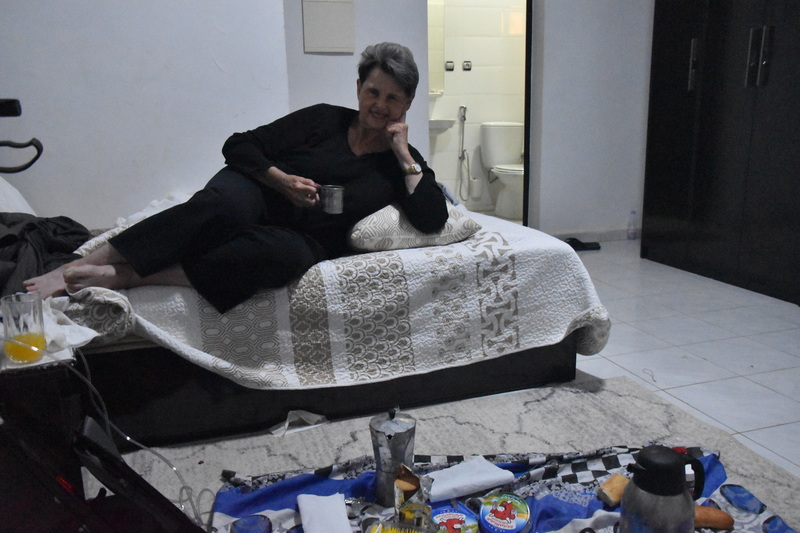 These hotels did not serve food or provide anything except a plain room with toilet facilities. They were basic and they worked for us. 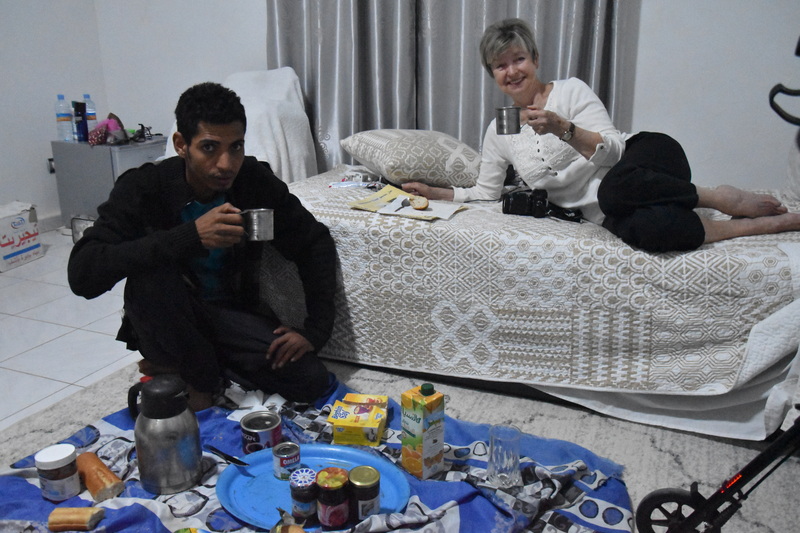 But they didn’t provide any food so Mounir and Mohamed unloaded our food supplies from the truck and spread a fabric cover on the floor of our room and provided us a meal, picnic style. 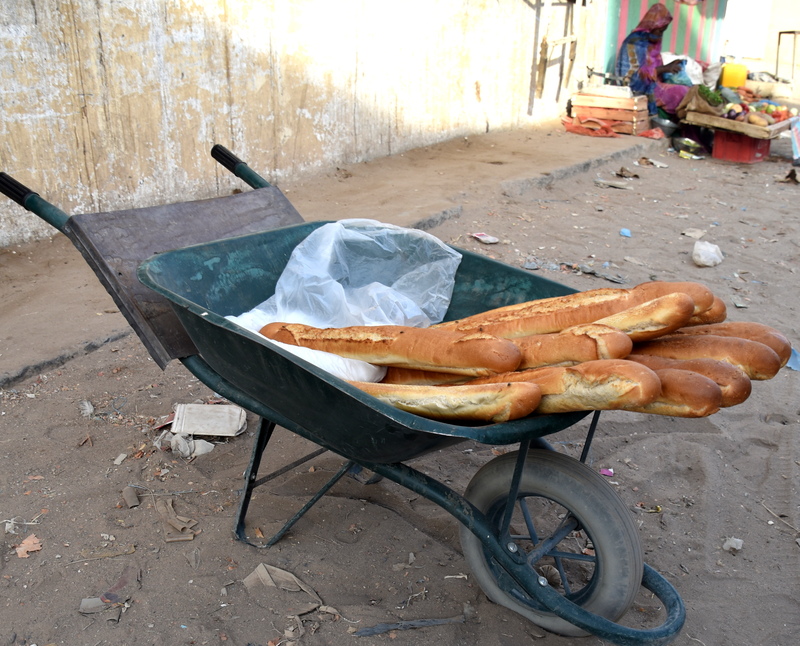 We had mixed vegetables from cans sometimes with tuna fish and olives and dates and a long loaf of uncovered bread from the market that he bought out of a wheelbarrow that probably was covered with sand. So half way to our final destination, we stopped at a hotel of bungalows with a bed and natural toilet inside. 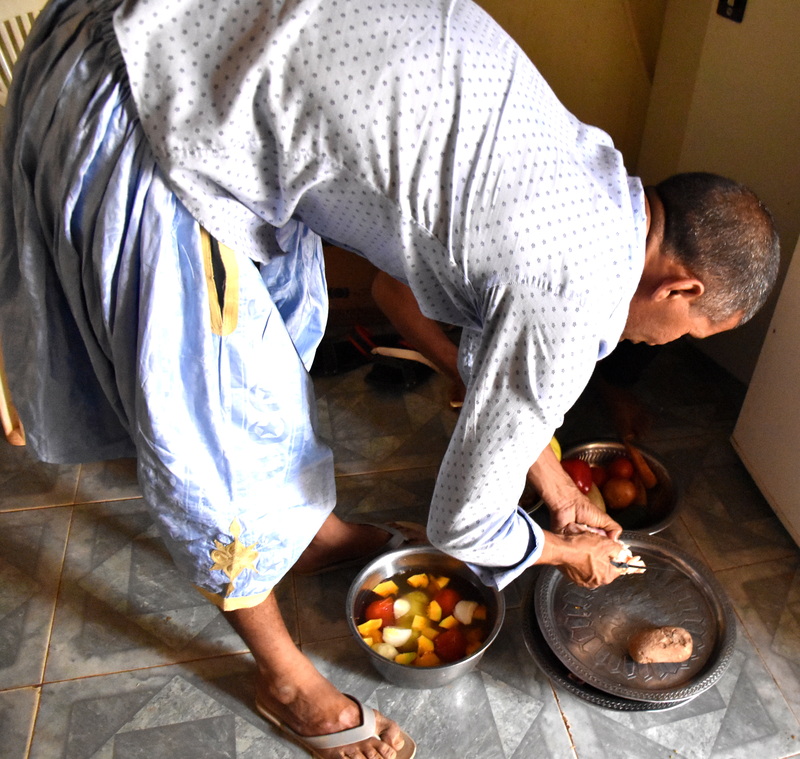 And inside that room, Mounir fixed our first meal. Mounir wanted to cook meat inside our room but I told him I could not breathe smoke or any pollutants. She he cooked outside on a small portable cooker and bought a chicken for us at the local market. 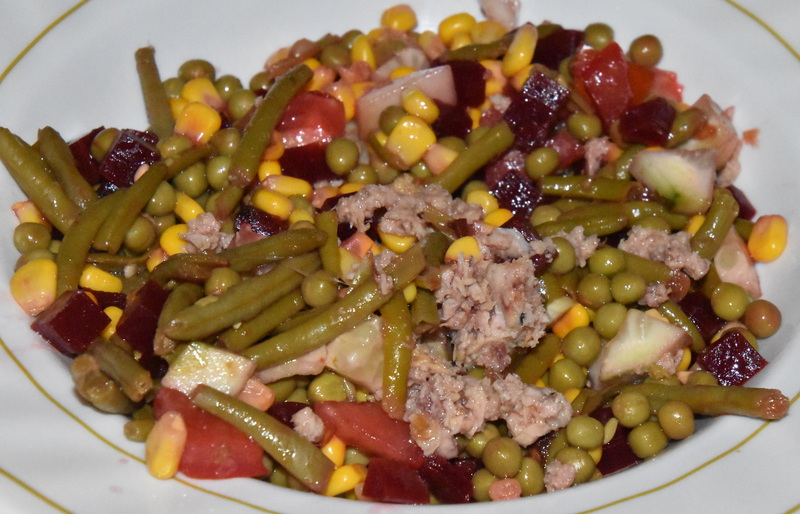 It was meaty and delicious and so were the mixed vegetables from cans. 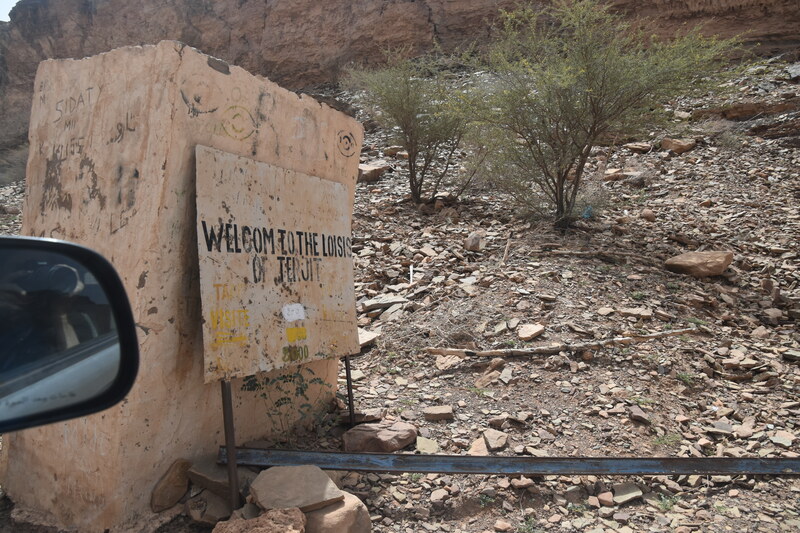 On this day, we were going to see the Oasis in the desert. So, I figured it would be a short ride to get to it. I had seen one oasis city in the desert in United Arab Emirates so I was looking forward to seeing this one. 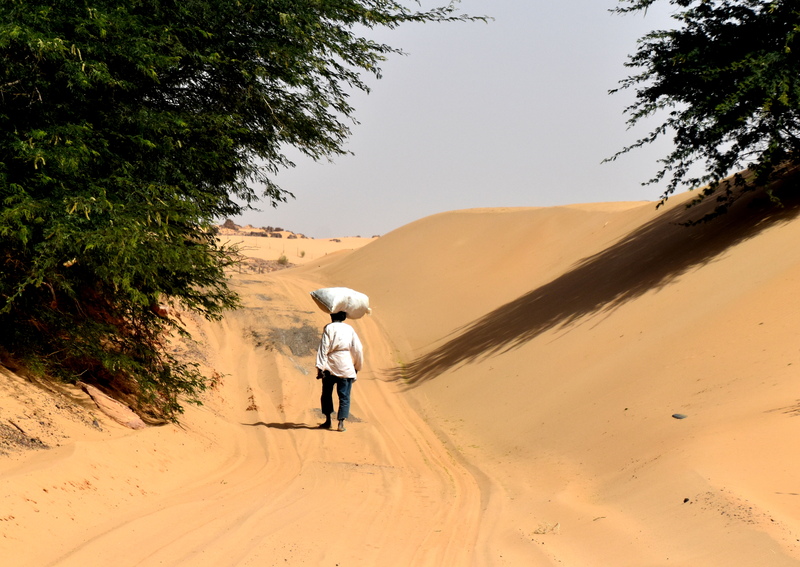 Mohamed found a little path and turned onto it from the paved highway into the Sahara Desert and headed toward the Oasis. We were following a caravan trail and the ride was smooth, bumpy, enjoyable and adventurous. 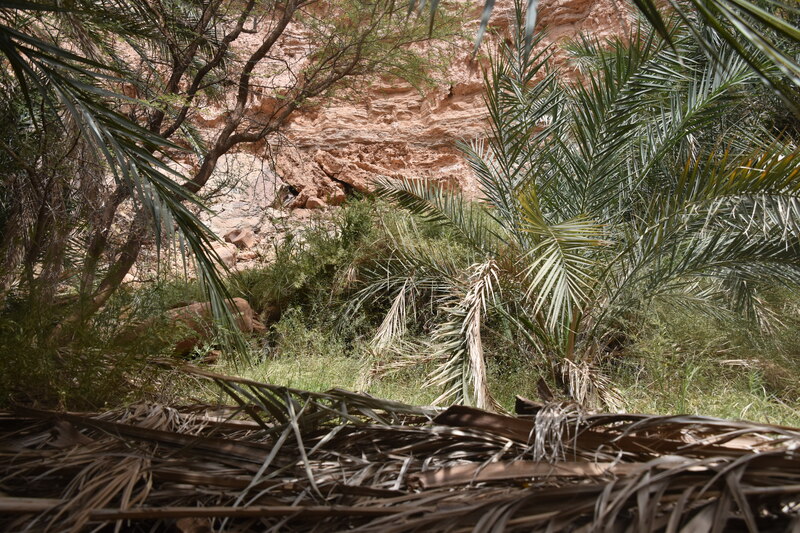 We were amazed that trees and bushes and shrubs were in the desert and they were living. 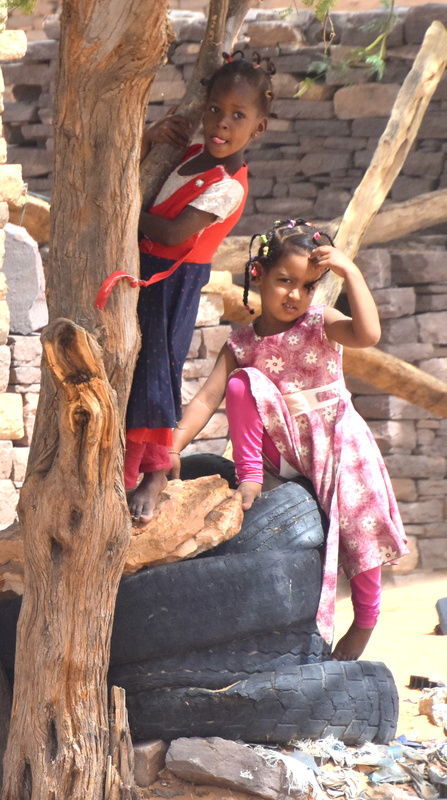 Mohamed and Mounir both agreed it was normal for a desert to have some greenery. The caravan route was not straight, and we turned right and left many times. And every turn was a different and beautiful scene. One turn we made, we came upon the oasis. There was a pond of water in the middle of nowhere that was about 50 feet long and 20 feet wide. And sitting beside it were 6 cows. 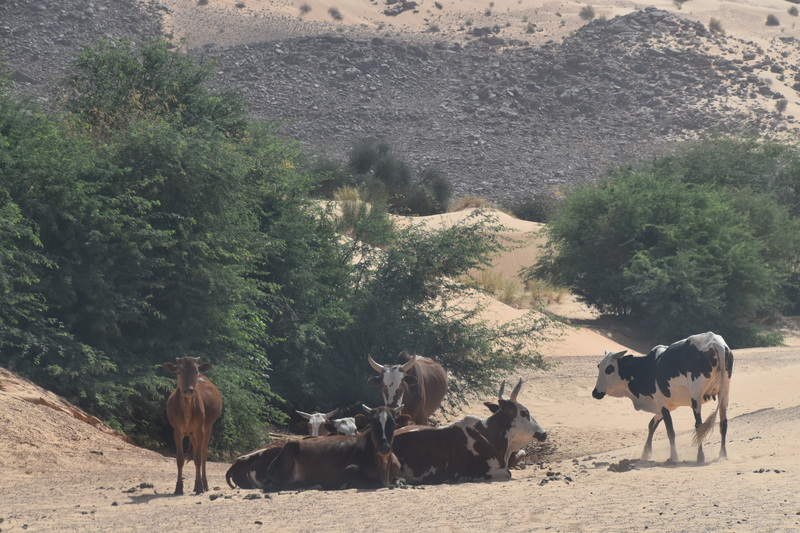 I was shocked and amazed that a desert would have cows deep inside it. 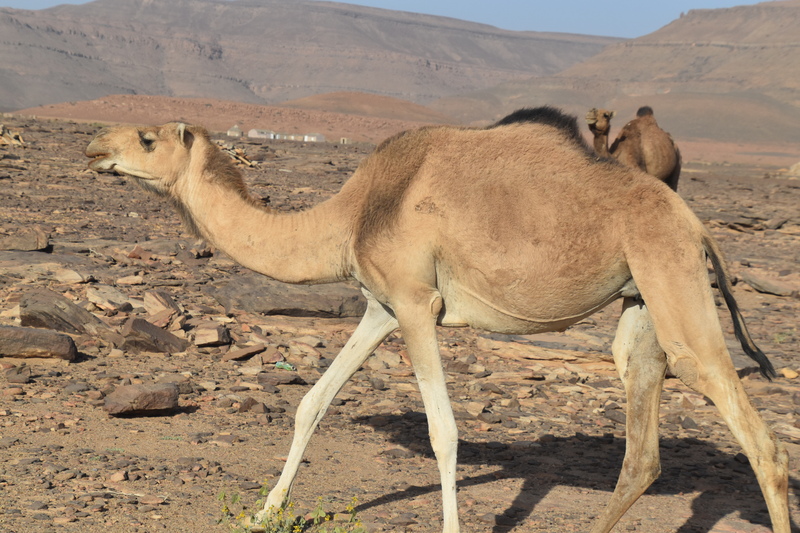 We also saw several camels as we progressed along the way. But to my amazement, this was not the oasis we were going to see. So we continued on the trail and on and on. 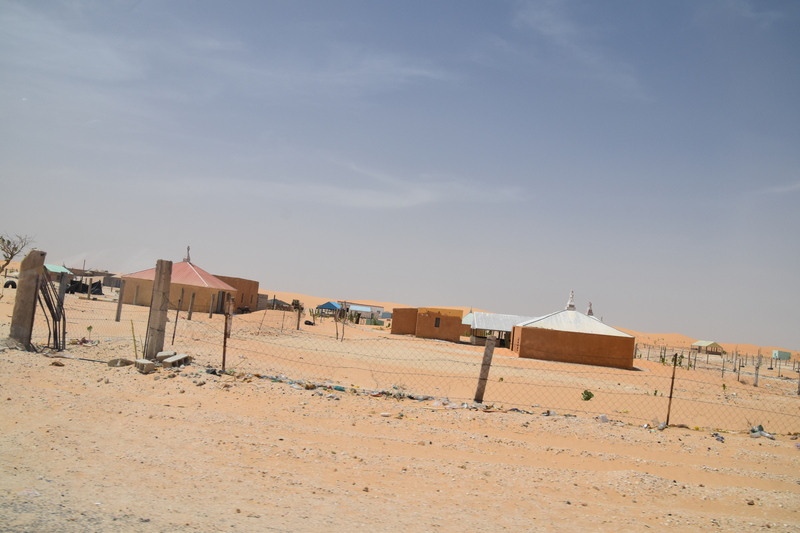 We saw huts and little villages as we proceeded deeper into the Sahara Desert. People actually lived in the desert and seem to be surviving just fine. I never dreamed people could live in the desert. But now I know they can. 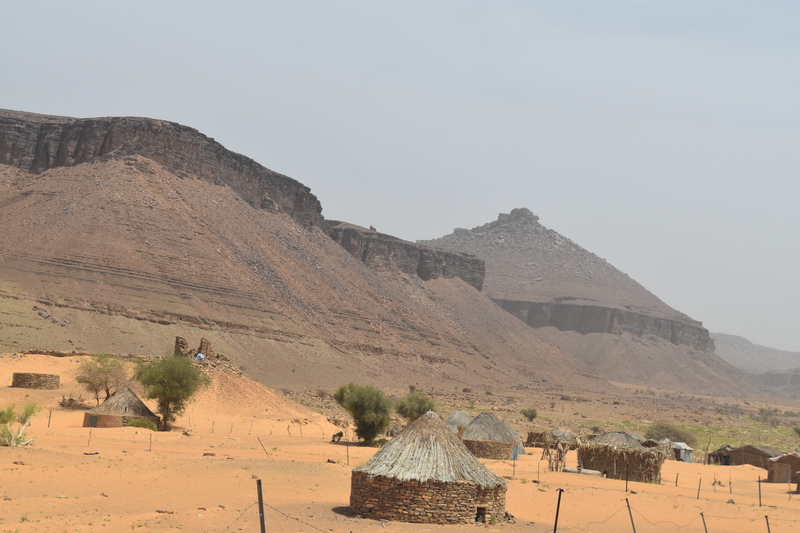 We were into the Sahara Desert for almost an hour and a half now and finally we began to ask “Are we there yet?” And finally, Mohamed indicated we were near. But we kept driving and driving through villages and trees. Finally we parked after 2 hours of driving in the sand and we walked up to the oasis. And we walked and we climbed up the hill and the terrain was natural and not a smooth sidewalk. I was so tired from the day before that I could barely make the climb. 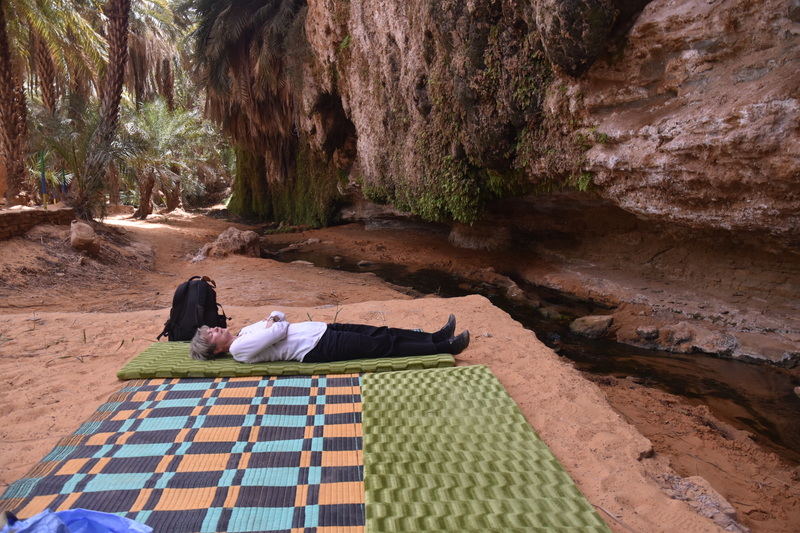 But with the help of Mohamed and Mounir, I finally made it to the oasis. 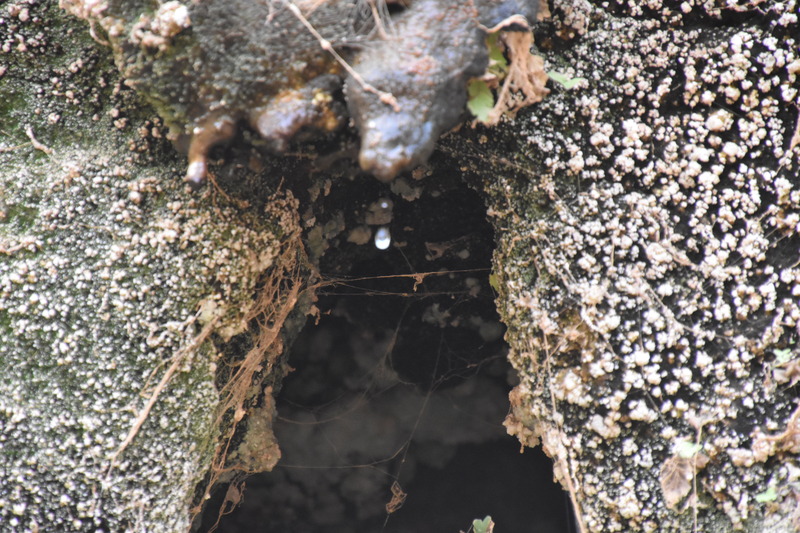 It was a wall of different layers of dirt/rock/sand with water drops falling down into the stream below. It was a silent beauty. A large fabric cover was on the ground for us to rest on and to have a picnic. 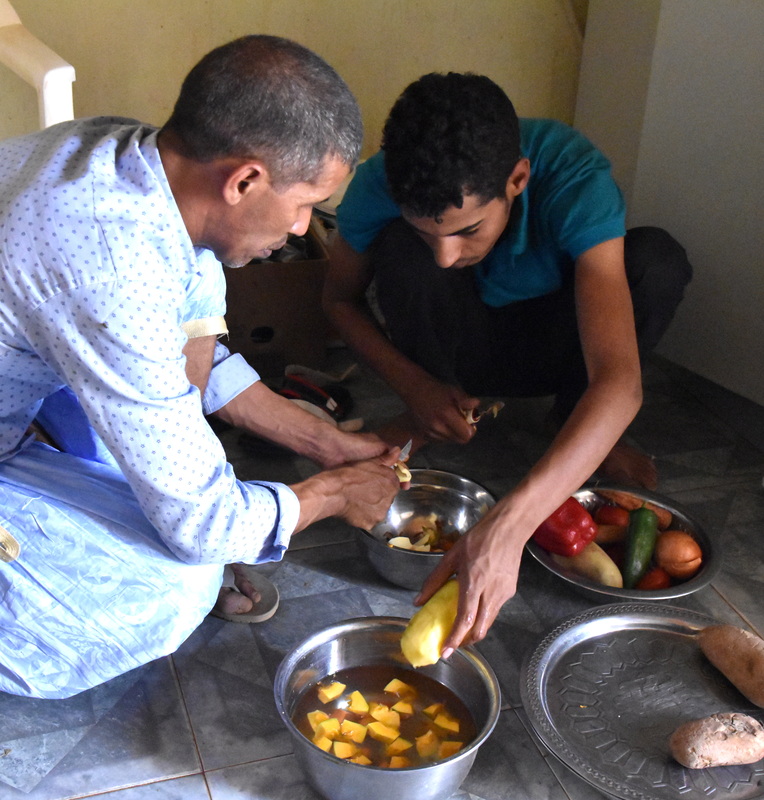 So Mohamed and Mounir brought up our food supplies from the truck and prepared our dish of mixed vegetables from various cans. 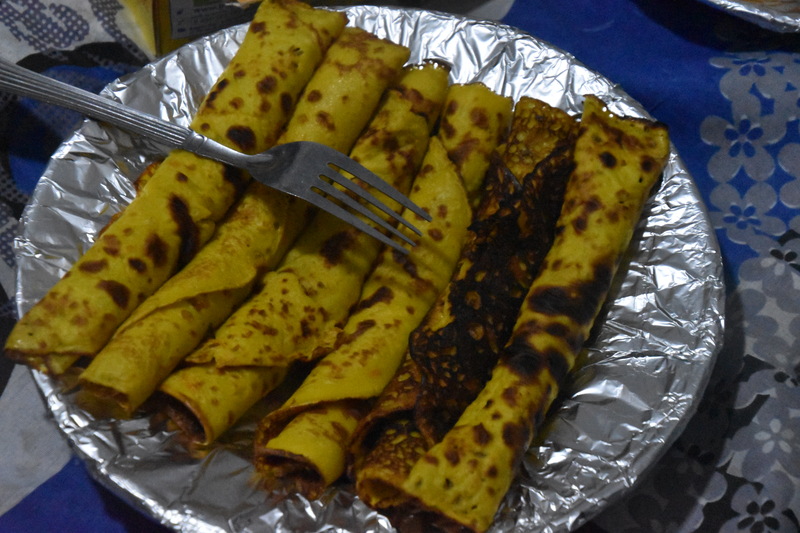 It tasted good as we rested from the long bumpy ride through the Sahara Desert. 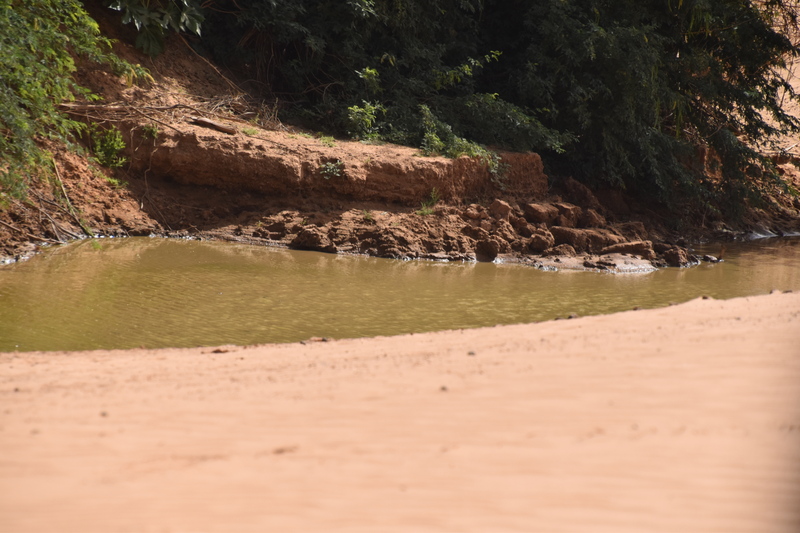 It was so relaxing to watch the drops of water quietly fall into the stream below and to wonder in amazement how this could exist in the middle of a dry desert. And it was refreshing to just see water and learn that this can and does exist in the Sahara Desert. But the enjoyment and rest soon ended. We made it back down the hill to the truck and continued driving/riding further into the desert. I was getting real thirsty after another long drive so I took a bottle of water and began to drink it. 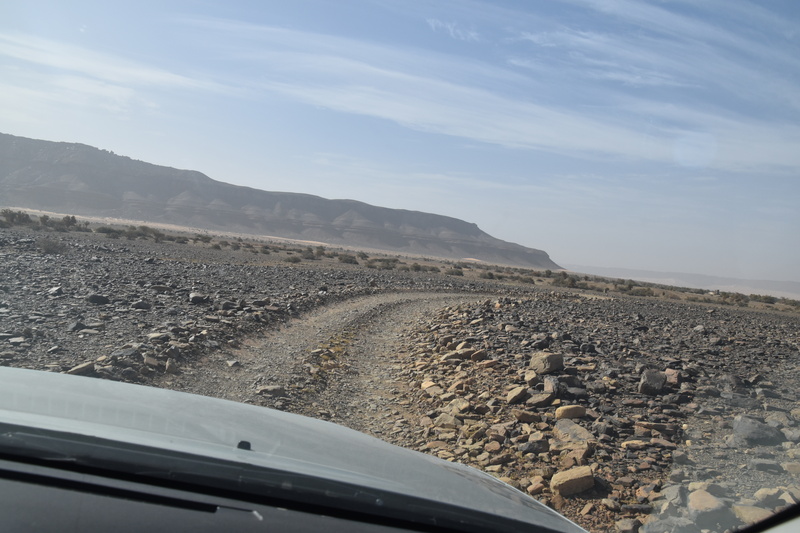 And just then, Mohamed stopped the truck that was bumping, and rocking and rolling along the desert path so I could drink without spilling the water or cutting my lip on the container. Oh, the water tasted so good and I finally finished so we could proceed further into the Sahara Desert. But there was one problem. The truck wouldn’t move because it was stuck in the sand. And we were in the middle of nowhere. And I didn’t know if anyone knew where we were. I quietly became worried if we would ever be found as Mohamed and Mounir tried to get us unstuck. First, they tried digging out the sand from the front wheels. That didn’t work. Then they tried putting bark and limbs from nearby trees under the tires and that didn’t work. Then they tried letting air out of the tires and that didn’t work. Then they tried digging out more sand and rocking the vehicle back and forth. Nothing worked. Thirty minutes had passed as they tried endlessly to get the truck unstuck. Then, they tried everything they tried before and added Mounir‘s pushing power and the truck slowly began to move and we slowly became unstuck and moving again. June and I thanked them and thanked them for successfully getting us unstuck. So then we headed straight to a car repair shop in a small village in the desert where we could get air to refill the tires. It was a glorious moment when we were back safe and sound and moving again. 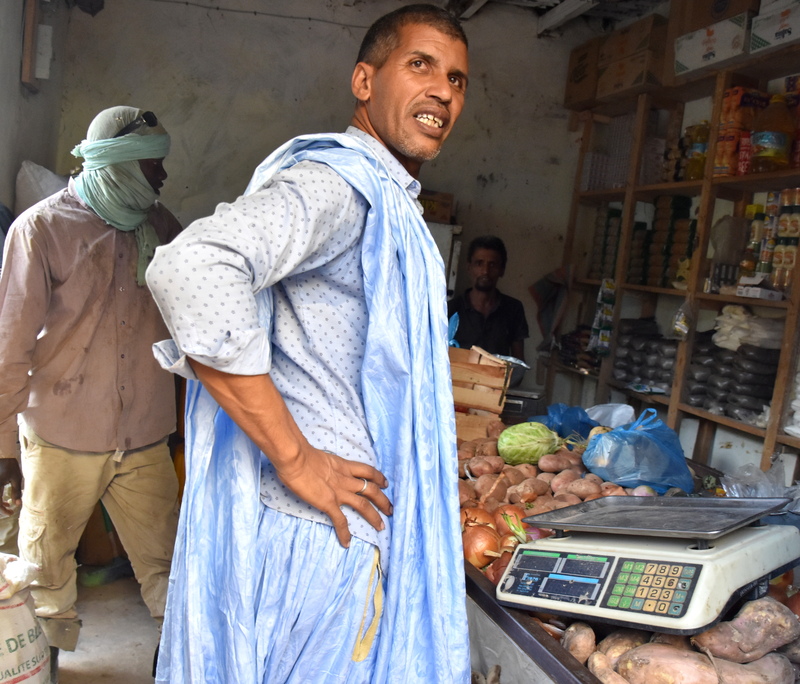 Mounir went to local markets when they were available several times to buy meat for our meals. He wore his bou-bou (boo-boo) men’s traditional attire. These 2 girls watched us the entire time we were having air put back in our tires at the auto repair shop in the desert. And we were back on the paved highway on the way to our hotel nearby and the wind was blowing and streaks of sand blew again. 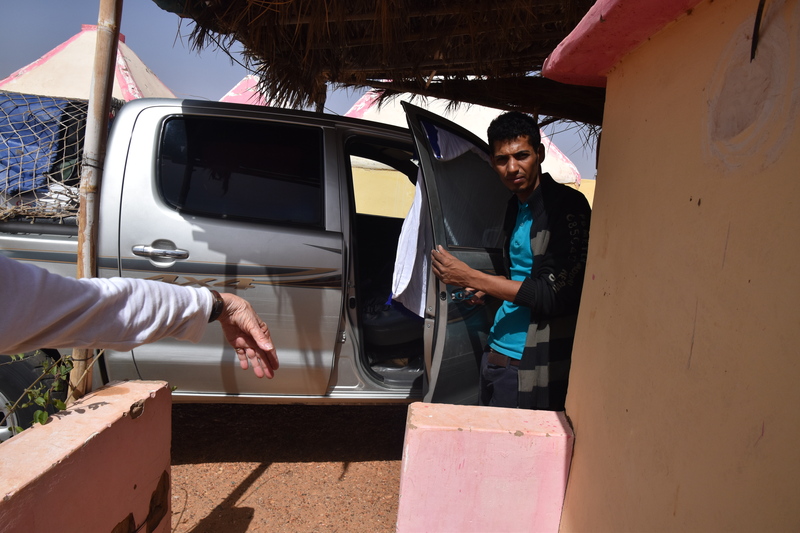 And we were reliving the unbelievable experience we just had at an oasis and getting stuck in the Sahara Desert as we followed a caravan route. We never had food poisoning or any problems. And Mohamed and Mounir never spoke a word of our language and we never spoke a word of their language. We used the charade method until I remembered the Translate app on my iPhone. And when Mohamed heard our question in his language, he celebrated with joy. And we did also. Priceless.